Microsoft Office 365 Sharepoint is becoming popular because it provides effective business collaboration and real-time document sharing. This significant tool allows everyone to their manage documents and information in one place, so that their clients and colleagues can access from virtually anywhere. This course prepares you to better understand the home page, the team site and the content types, teaches you how to update your profile, get familiar with how to share and track items and much more. 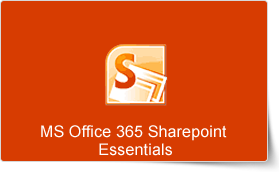 This Microsoft Office 365 Sharepoint Essentials training course can be delivered at your premises by one of our expert local or international trainers or live online using our HIVE technology. In this workshop your participants will learn how to sign on to the Microsoft Office 365 portal, and see where their Sharepoint content will be stored. They will learn about the home page of the portal, where to sign into the Team Site and the Office 365 web apps, including Outlook. Through Sharepoint Essentials your participants will take a look at the Team Site and how to navigate around and view the Sharepoint site. Sharepoint Online is the Office 365 answer to collaboration. Sharepoint Online will let your participants manage documents and information in one place that customers and colleagues can access from virtually anywhere.